Here’s the current Tony Robbins Unleash the Power Within (UPW) schedule for 2019. Book now to get early bird prices and to secure your place at the event. Remember to put the dates in your calendar! Be amongst the first to know about the next Tony Robbins live events in the US with our free alert service. Tip to Get the Best Deal: You can save $445-$847.50 off Unleash the Power Within - Dallas tickets by booking today. Simply click the button to get the deals! Tip to Get the Best Deal: Use the promo code below to get an additional 20% Off UPW Singapore tickets: Simply click below to get the 20% off promo code: Add this just before the check-out. Note that this deal ends on 25th February 2019. Click "Copy" to save the promo code then click the "Go to Offer" button below. Paste the code in just before check-out to activate the 20% Off discount. 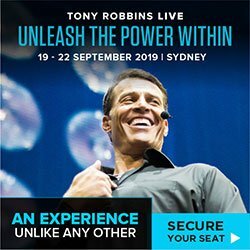 Tip to Get the Best Deal: You can save $700-$1200 off Unleash the Power Within - Sydney tickets by booking today. Simply click the button to get the deals! Will Any More US Locations Be Added to the 2019 UPW Schedule? Tip: You can often get the best prices and secure the seating location that you want by being amongst the first to book. If you'd like to be the amongst the first to know about new US events added to Tony's schedule, simply sign up below and we'll email you an alert as soon as any new dates / locations are available to book online. Can I see a preview of Unleash the Power Within? The best place to get a preview of the Unleash the Power Within experience is at the official site for the location that you’re interested in, here: UPW Los Angeles, UPW London, UPW Singapore, UPW Sydney. Where can I find out more about Tony Robbins and the Unleash the Power Within Events? 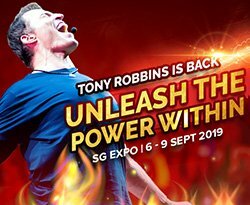 You can learn more about Tony Robbins, see his best audiobooks, programs and find out more about the Unleash the Power Within events on the Best of Tony Robbins page. How can I get the best deal on UPW tickets? We always post the best deals for UPW tickets on this page! 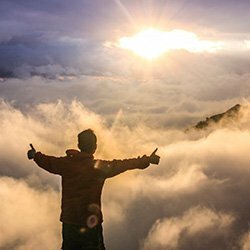 Where Has Tony Robbins Held Unleash The Power Within? Tony maintains a busy tour event calendar! He's visited numerous locations including Chicago, New York, Garland TX, Miami FL, Las Vegas, West Palm Beach, Los Angeles (US), Toronto (Canada), Sydney, Melbourne (Australia) and Singapore. The 2018 UPW schedule included Singapore, San Jose (US), London (UK), Chicago (US), Sydney (Australia) and New Jersey (US). I'll add the new dates and locations here as they are made available to make sure this UPW schedule shows all the confirmed dates. Share this page with your friends and schedule a UPW 2019 event together in Dallas, London, Singapore or Sydney - good luck!